It seems that the University of Kentucky is so embarrassed by the failures of its basketball and football teams over the last year that it has decided to change the school colors from blue and white to red, black and white. The Wildcat basketball team lost in the first round of the NIT last year while arch-rival Louisville won the NCAA championship. And the UK football team lost to Western Kentucky for the second year in a row on Saturday. Louisville's colors are red and black while Western's colors are red and white. So, maybe UK figured if it couldn't beat the Cardinals and Hilltoppers it would join them. Of course, the Wildcats aren't really changing their colors. 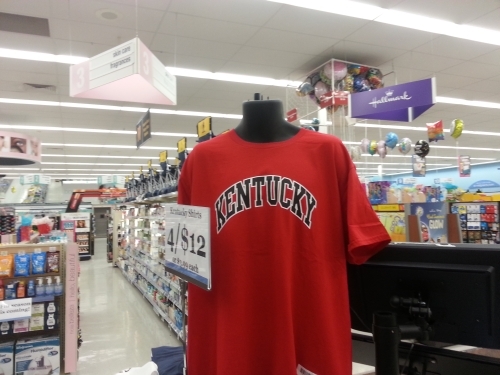 And the shirt in the photo shown above isn't licensed by UK, as is evident by the fact that it doesn't refer directly to the university or use the nickname Wildcats. But it is startling, to say the least. I have always thought "school shirts" in pastels or camofaluage were unsightly. School shirts should use the school's colors, even if they aren't licensed. But to use the colors of your arch rival is just shocking. I can't imagine a Kentucky fan buying such a shirt. And Louisville fans must be laughing till their sides hurt at the sight of it.